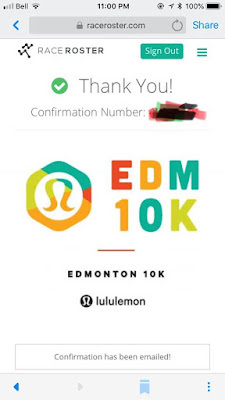 When they announced the first Lululemon Edmonton 10K a few months ago, I was so disappointed that I had to miss out on it. 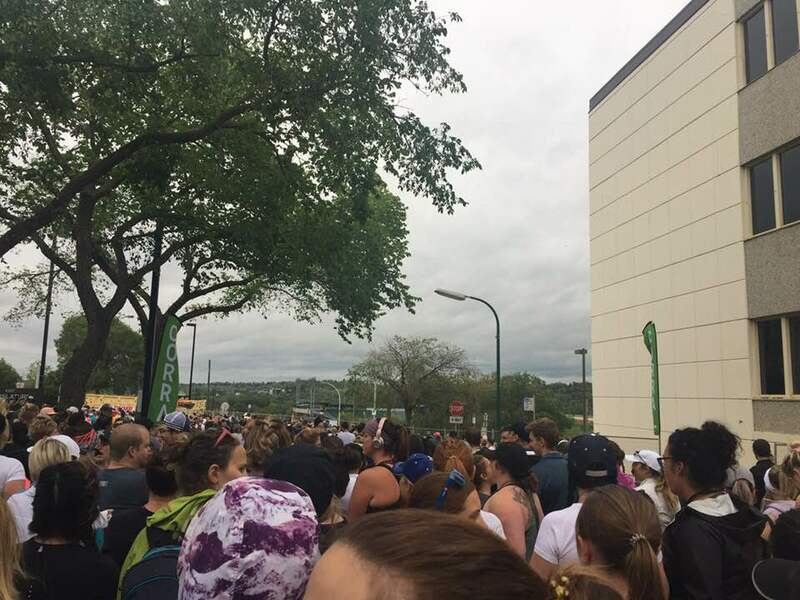 When all of my running friends were registering for it and posting that they got in on social media, I defintely was suffering from #fomo. Greg had the last 2 weeks of July off for vacation and we were probably not going to be in town. However, it turned out all 4 guys on Greg`s team had booked that week off and since we had no plans yet, he volunteered to move one of his weeks off to August. Unfortunately, the race was now sold out and my friend Heather who had originally had 2 bibs and did offer it to me months ago had just sold it. I had accepted that I was going to just live vicariously through all of my friends who would be there. But fate worked in my way because Lululemon YYC had some extra spots available and they reached out to my friend Bre to see if she knew anybody that needed a bib. 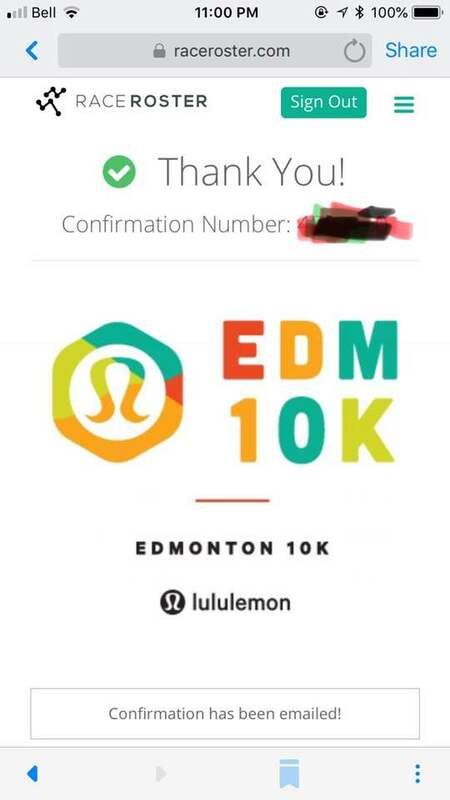 She knew I was looking for a bib so she messaged me with the link for the registration and I was able to sucessfully register for the race! I am so grateful for Bre and Lululemon YYC for letting me participate in this inaugral event. 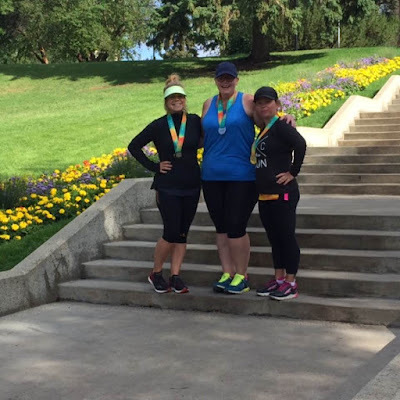 On Saturday morning, I picked up Heather and made our way to Edmonton for the race. We had a fantastic drive with great conversation and a lot of ABBA. It was the best. We made it to West Edmonton and found what I think was the very last parking spot in the entire mall. The mall was INSANE. We somehow Lululemon which had moved since I was last there about 18 months ago. It was so crazy in there. This is where you picked up your packet for the race, you got 25% off with your race bib and they had a dj playing. You could barely move haha. I bought the Press Pause Jacket in black and now I really hope the lavendar goes on WMTM because I really need that too hahah. We had a quick stop at the new winners/homesense store and then headed on our way to our hotel. While we were in the mall, there was a torrential downpour but we managed to miss that thank goodness! Instead of getting shorts like we do with the Seawheeze, we were gifted Short Sleeved Swiftly`s instead which I was pretty excited about. I had a bright pink one that I LOVED and I lost it somewhere and have been unable to replace it. Although this one is white, I am still loving it and probably will only wear it on short runs where my kids are not around hahaha. We made it without getting lost to our hotel. 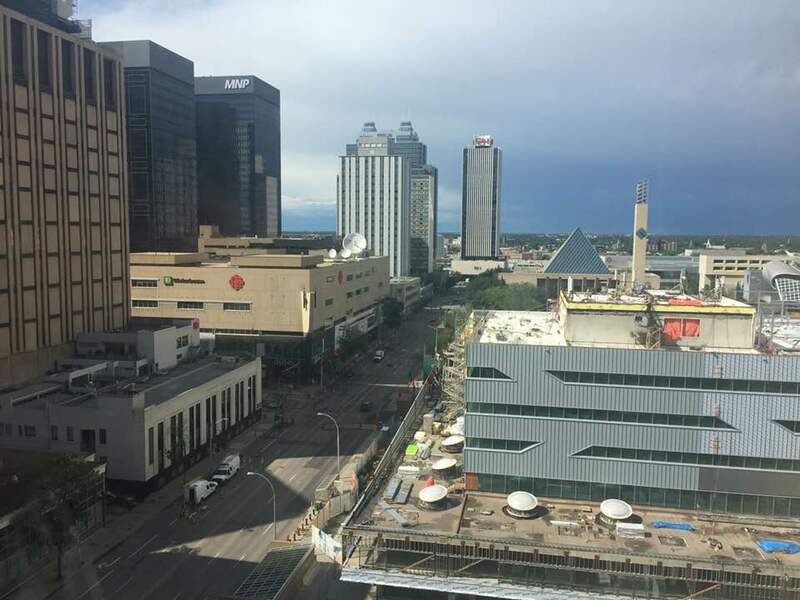 Heather had booked the Westin at the special Lululemon 10k rate and it was a huge room. We each got our own bed and our own side. It had a massive window which I think the hotel relied on to give the hotel a lot of natural light but we both agreed that the hotel felt really dark. Espeically the bathroom haha. We googled restaurants in the near the Westin and decided on Local since I had been there in Vancouver and loved it and it was only 2k away. We could have probably walked it but with all the rain in the forecast, I was not about to get caught in a rain storm walking hahaha. Our dinner at Local was not that great. I loved my yam fries and the truffle lemon dip but other than that everything else was a disappointment. Heather wasn`t too keen on hers either. While we were in the parking lot getting in our car, i randomly looked up and saw a human showering in the apartment behind the restaurant. The window was semi frosted but clear enough that you knew exactly what was going on. It was pretty crazy hahah. We went back to our hotel room with some newly purchased snacks and turned on some TLC. Neither of us get that channel back home so we happily enjoyed our Saturday night watching Four Weddings and Say Yes To The Dress: Atlanta. I fell asleep shortly after those ended and quite enjoyed sleeping in a bed all to myself haha. One of Heather`s friends was also running with us and she had come down with her husband who nicely drove us to and from the hotel. It was only a 2k walk but it was downhill there and uphill back. For someone who is battling with a neverending achilles injury, hills are virtually a no go. 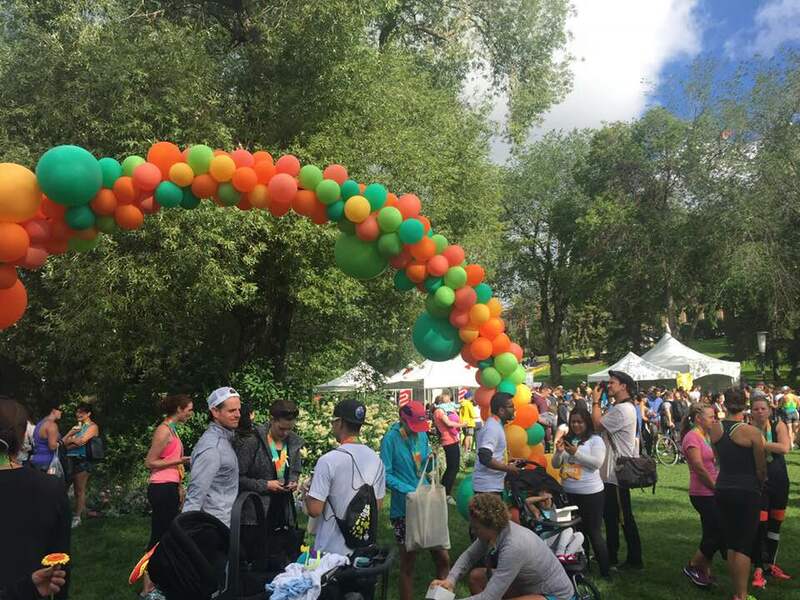 There were 5000 people participating in the race and it was divided into 3 sections: Runners, Walkers + Baby Strollers. The Runners were then subdivided into further colour corrals and based on my estimated finish, I should have been in the green corral but since I was late entry, I was in the very last corral and it kinda sucked hahaha. The race started at 730am and I was across the start line at around 7:39. The race started at the Alberta Legislative Grounds and then went up the new Highline Bridge or whatever it was called around Saskatchewan Drive and some other streets, the University of Alberta and then back down the bridge back into the legislature grounds. When the race started immediately going up hill, I was really worried whether or not my achilles would hold out and thankfully it did. I thought it was only about 2 km up and then flat for 6k and down for 2k but Heather thinks it was up hill for 5 and downhill for 5. I have no idea who is right haha. It was really congested for what felt like forever and I was worried at that it might never spread out but I finally noticed having more room around the 4k mark. Despite being cold and rainy at the start, it got really nice for the last half of the race before getting cold and windy again. Also, the bridge was kinda windy going up but because there were so many people, you were blocked pretty good from it but on the way back was a whole other story. It was insane. One girl lost her hat but I was able to grab it for her thank goodness. I had to turn off my podcast and put my airpods in my belt bag because I was sure that they would fly out or something. 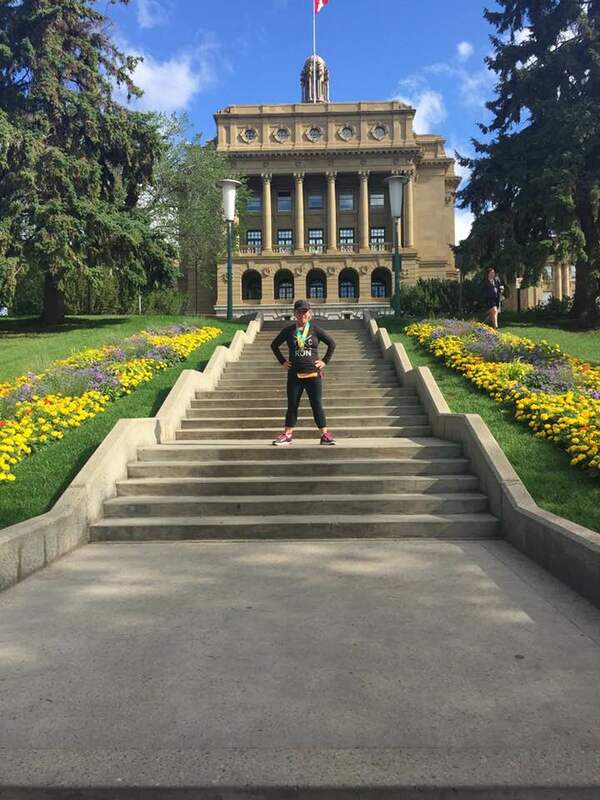 I then ran the whole bridge with my hand on the bill of my hat so that it wouldn`t fly away. 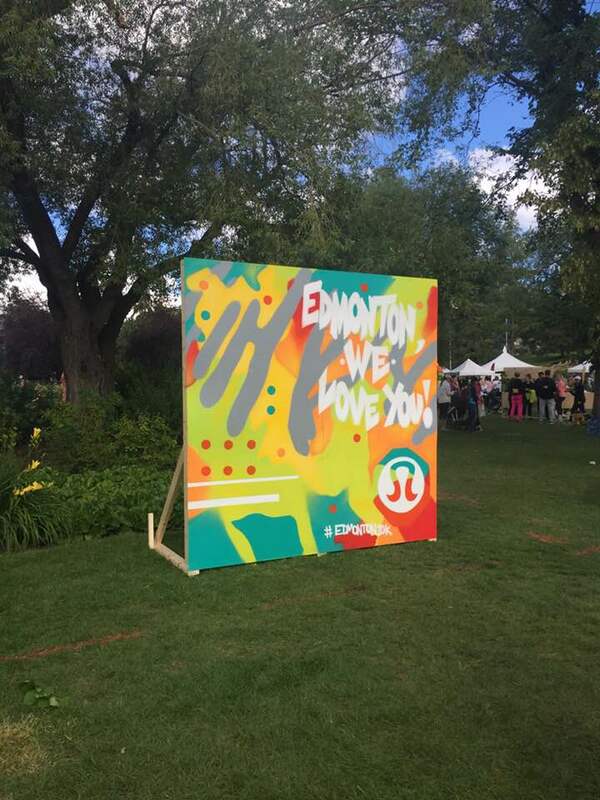 The community of Edmonton really embraced this race which honestly really surprised me. 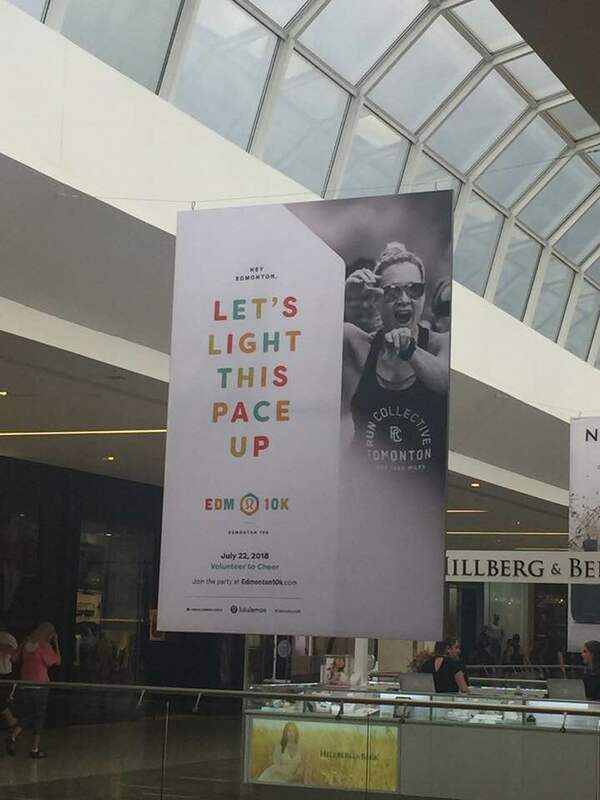 Not because I thought that the folks of Edmonton wouldn`t do anything but because it was just a 10k race not a major half or full marathon. But Edmonton, you brought it. The amount of people out cheering was the best and I loved it. 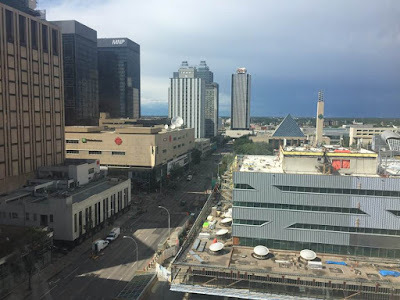 Having only ever came to Edmonton for some shopping on the way to a concert, it was really nice to see parts of the city that I never have before. This might have been my first race in Edmonton, but it won`t be my last that is for sure. 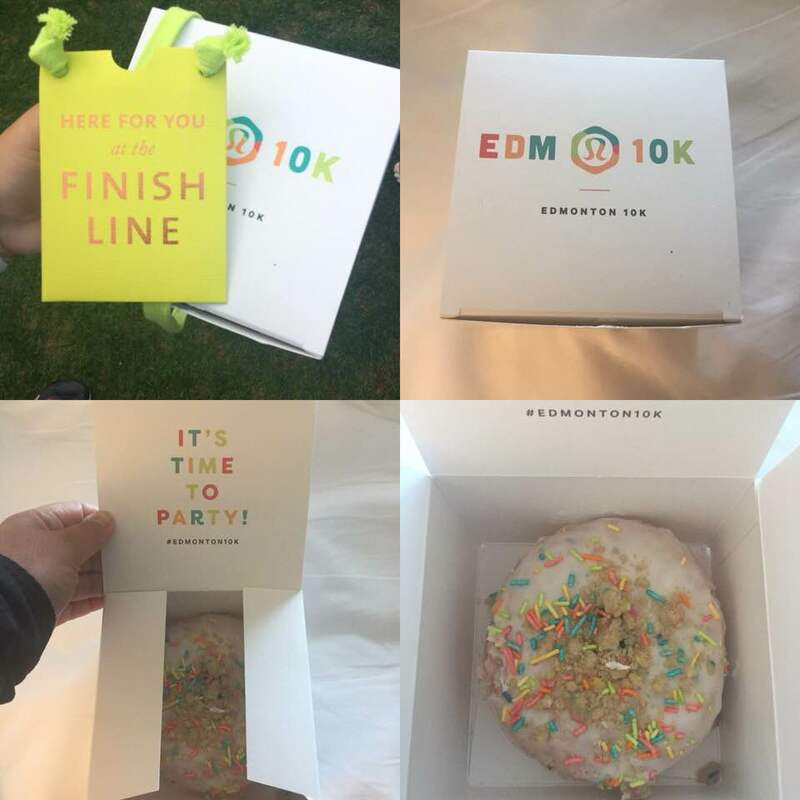 Once we crossed the finish line we received donuts and a coupon for Saje. The donut was so ridiculous. I saved it for home and I only got 2 bites out of it before Greg devoured it all. Such a fun treat to end the race with. They also had juice, a banana, and a kind bar as a post race snack. There was lots to do after the race. Think Sunset Festival meets the first post race party at the Seawheeze. Basically less vendors and no band but still lots of other fun things to do. 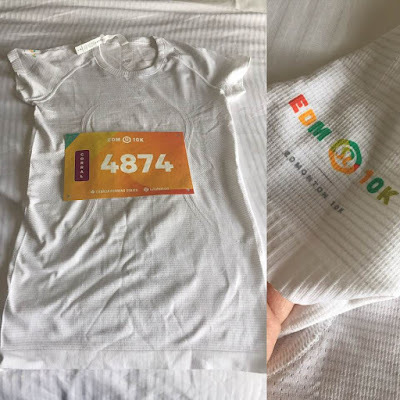 They had physio booths, massage booths, saje booths, more juice and kind bars, a rep from saucony with various shoes that they had just released, there was a merchandise booth where you could have a special edition logo put on your item for an additional $10. 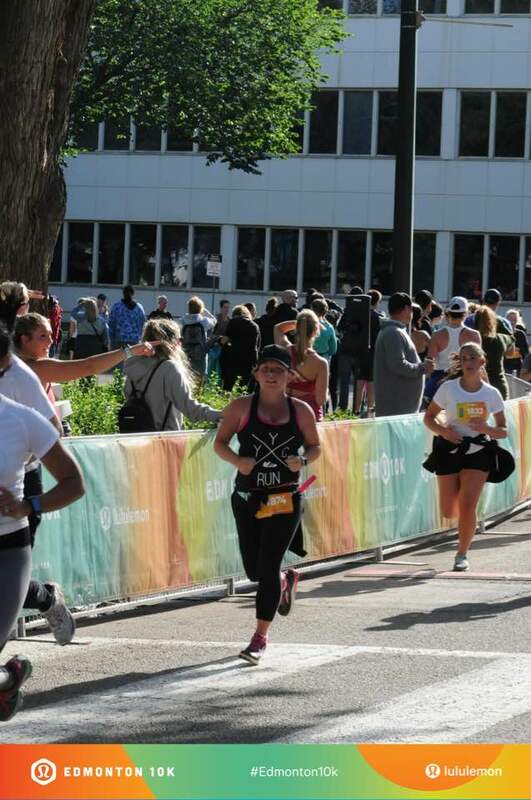 My official time was 1:11: 06 and I almost cried with happiness and relief. I honestly had zero expectatons going into this race. I hadn`t ran well basically since the Calgary Marathon 2 months ago and bombed my Diva Half Marathon last month so really my goal was to just finish. I was just happy to be there to be honest. This race was exactly what I needed at just the right time. I honestly was doubting my future in this sport and contemplating retirement after the Seawheeze. I know right, holy melodramtic haha. Such huge confidence booster. That`s not to say that my achilles didn`t bother me because it did but it was tolerable. I still have a LONG way to go before Seawheeze in September but hopefully I am going in the right direction. Many many thanks to my good friend Heather for letting me crash her hotel and basically her whole weekend so I could make it to the race. Greg and the girls would have came with me but it wouldn`t have been as much fun. We had so much fun eating snacks and milkshakes, singing our heart out to Abba and The Greatest Showman, talking about everything and anything and I cannot wait to do it all again in Septembe - except via airplane haha. Also thanks for driving my car so I didn`t have to haha. The inaugural Lululemon Edmonton 10K was an absolute success and I hope more than anything that they bring it back next year and that I am able to attend it. It was so much fun. It was a stress free weekend being surrounded by 5000 other runners. It was a mini-wheeze and it was what Seawheeze should be. Thank you Lululemon + Lululemon YEG for a super fantasitic weekend, see you next year (hopefully).